It rained again, not much, but enough to make outside work annoying. Subsequently, I didn't get much done in actual work, but that's ok, I needed to do a little measuring and planning anyway. In addition we had our bank's appraiser come by this morning, so I had to take some time to show him around, all the improvements we had made since he was here last time. As we have a commercial loan, our bank wants to get our property appraised on an annual basis. 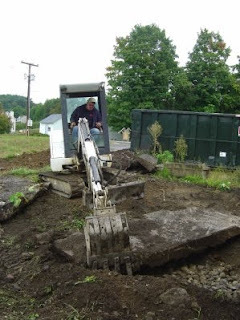 As announced, and despite the rain, Nick, our super duper pooper scooper septic system excavooter, came by today with his little digger to do some probing of the septic site.